So, the other day we focused our energy on how to stock up the garage and kitchen with supplies you will re-use again and again; for all of your favorite events and holidays. And today it is time to roll on over to the fun stuff and put together a quick list of the smaller details you will need to make each and every party a 'custom' & unique event! So first things first, you need to PICK A THEME!! Once you decide on a direction, well the rest, my friends, is smooth sailing! 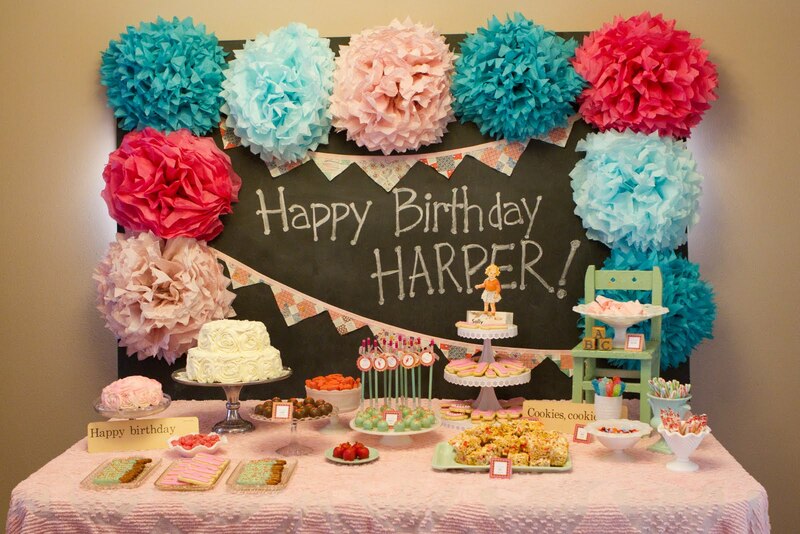 And you don't just need to stick with a theme for birthday parties....each and every one of your holidays can center around one idea as well (think a 'Milk & Cookies' Christmas party, a "Good as Gold' St. Patrick's Day bash, or a 'Brats & Beer-Tasting Oktoberfest' Halloween Party, just to name a few). 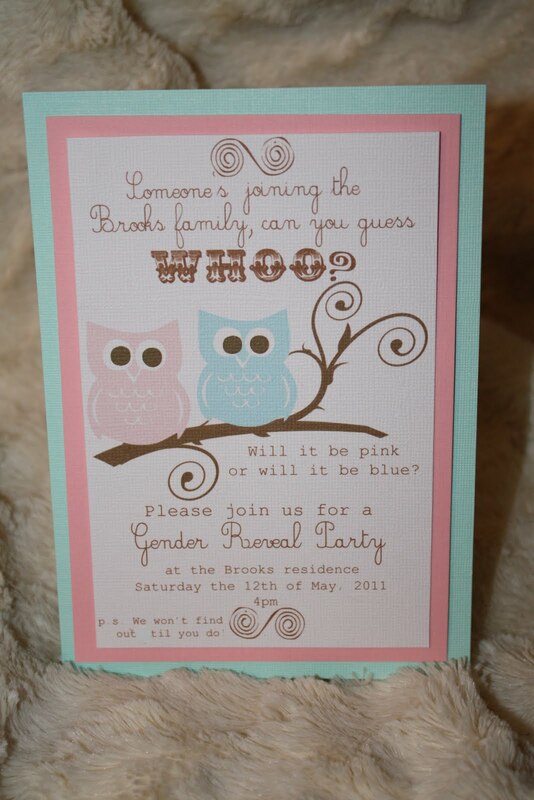 Having one central idea in mind will help you with every element of the planning process too! Know what else will help? The printable PDF list we have attached below for you to print up and whip out whenever you have a new party to put together!! So back to our 'ten things'; here goes . . .
Well, being this is our Juneberry Lane specialty, you know I am going to start with this EVER SO IMPORTANT item:) After all, you NEVER have a second chance to make a first impression!! A few Juneberry customs . . .
Super easy to make, extremely affordable, and precisely the right way to announce the theme of your party and to tie it all together. You can get these lovelies anywhere; make your own or order a simple, DIY version from Etsy (did I mention that Juneberry Lane makes custom, printable versions of whatever you need?) 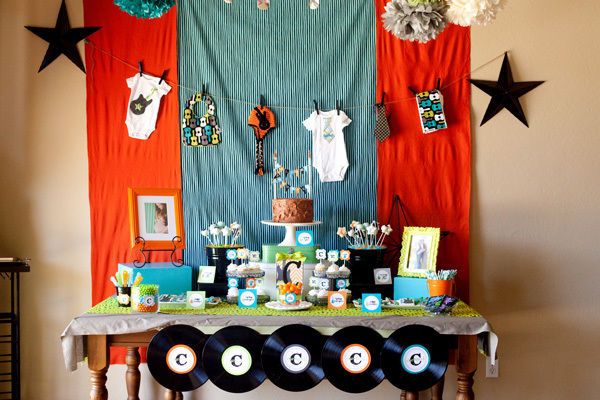 And don't be afraid to get creative; string up old vintage records as 'background' for a "Rock-a-Bye Baby' themed shower banner or a few pretty doily circles to 'girly' things up a bit! A couple of examples . . . 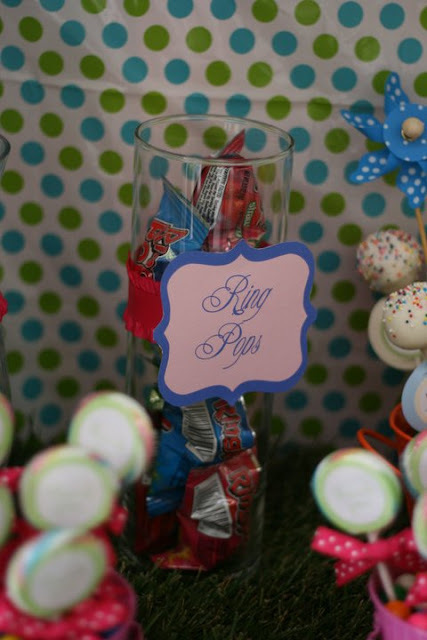 I grouped these all together because you can usually have a set 'custom-made' for you for your entire party for very cheap. 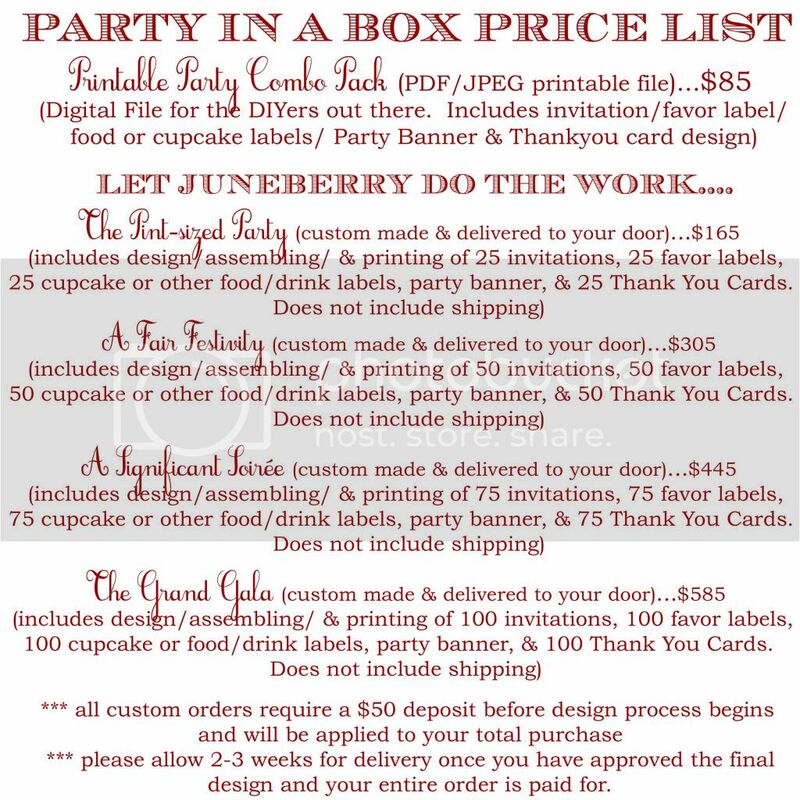 Once I have the template for a party invitation designed, I can easily turn them into any type of label you need for your party and am more than happy to do it at a fraction of the cost in lieu of selling the files separately. And I guarantee I am not alone! 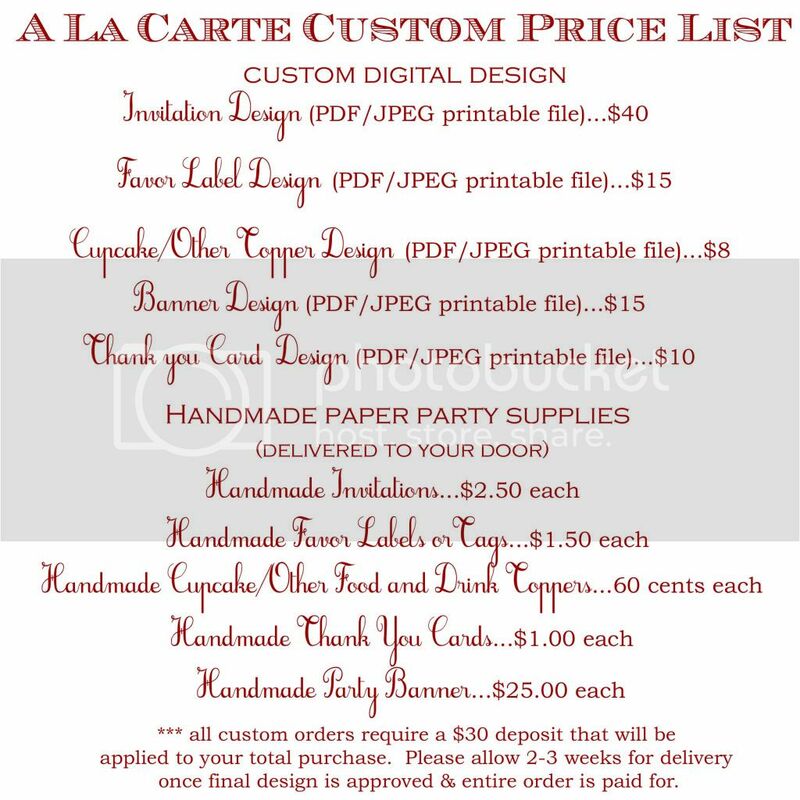 Just send a message to your favorite seller and ask if they will be willing to create matching labels & paper goods for you as a set for a discount! Some of our customs . . .
Fun, very affordable, and now available in any color you need, these little lovelies work great to dress up your cocktails & beverages and also make a cupcake fantastic in no time! 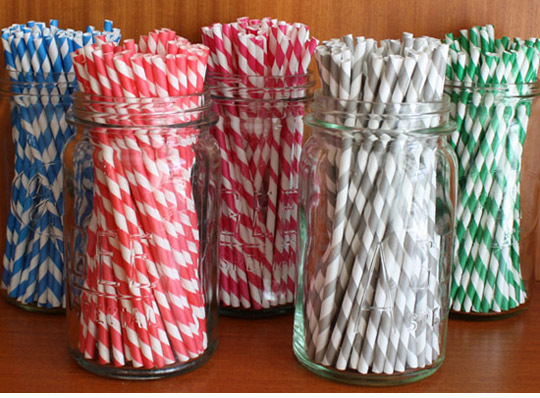 And since you already stocked up on those mason jars or $1 tree glass tumblers to re-use at every party, ordering a quick pack of pretty straws is the perfect way to spruce them up for whatever theme you have decided on! My absolute favorite seller is Sweet Estelle on Esty; fast, affordable, great selection, and high quality every time!! Just add the straw flags . 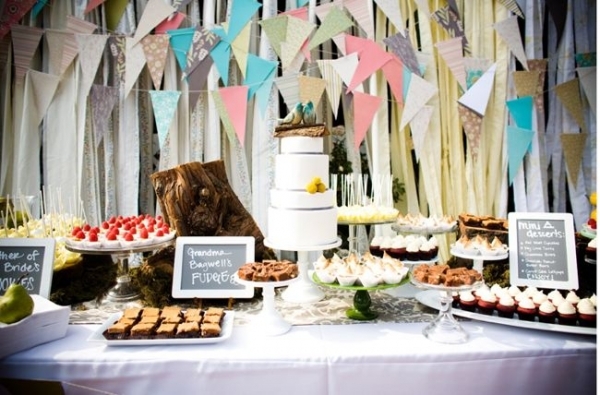 . .
You already have your re-usable table skirt, so now you will just need to find a table-top covering for your dessert and favor/beverage/gift table to match your event and put the icing on the cake, so to speak. Head to your local fabric store and buy 2-3 yards of your favorite fabric that goes along with your party colors & theme. You can leave the edges rough and just tuck them up under or hem them with a sewing machine or iron-on hem tape, it's up to you. Don't forget to give it a pass with a hot iron first, if the material allows! 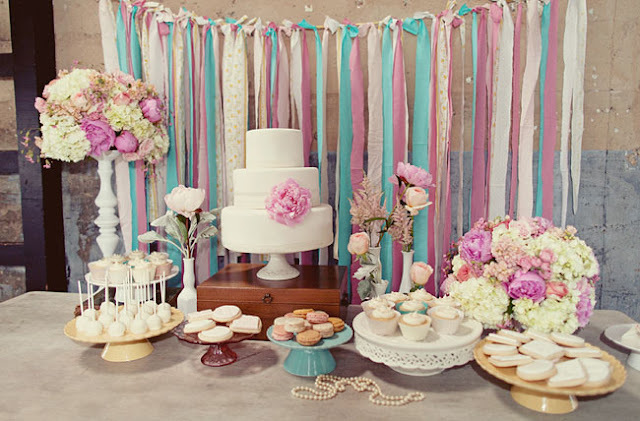 Nothing spoils a pretty dessert table like unsightly folds and wrinkles. 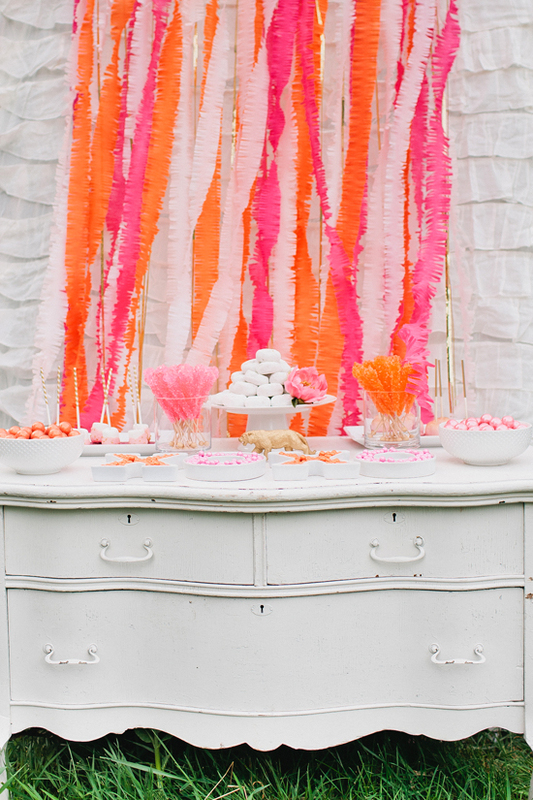 I see all types of backgrounds when perusing around for different party ideas to share with you, from a curtain of crinkled paper streamers to a wall of balloons and beyond. What's important here is to only go as far as time and your budget allow. 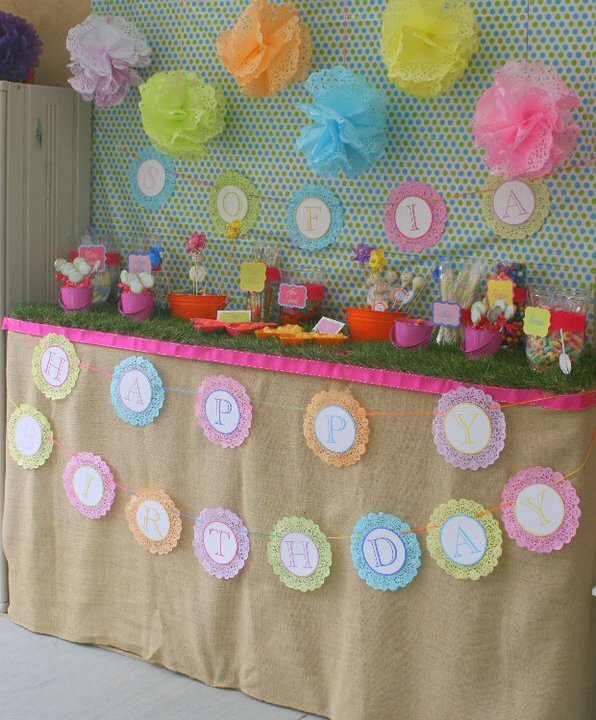 You can save a bundle by thinking out of the box-mini tissue poms scattered across the wall, a strand of paper or fabric bunting, or even a Target shower curtain in a retro-mod print that you love. Just see for yourself . . . Ask the seller who created your paper party goods to include a little label for these too; a quick print on the computer, a touch of cutting, hole-punching, and tying on will just take a few minutes and can add just the right touch! I love to cook and adore trying out new recipes, but when it comes to throwing a birthday party, the last thing I want is the stress of a new recipe or losing out on decorating time to slave away over the oven. 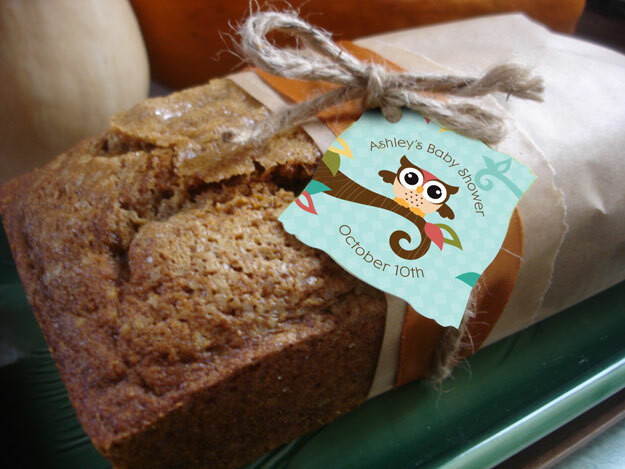 You don't have to drop a bundle of dough to have your day catered though! Now that you have gorgeous serveware to use again and again, you can order pizzas, sandwiches from your grocery store deli, or even El Pollo Loco or Baja Fresh and your guests will gobble up the good stuff in pure style! 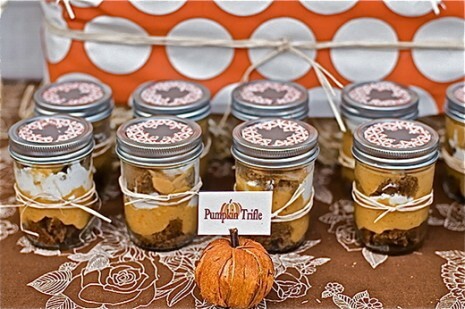 Even if you prefer to do all of the food prep yourself, make sure to test out any new recipes before the party. And if the event calls for it, feel free to go 'potluck style' and have every guest bring a different cookie (for the milk & cookies Christmas party, that is:) or judge a 'cook-off' and let everyone bring their best chili, brats, pies, or pasta. As for drinks; a few cases of water, beer, soda, and economy bottles of wine will do the trick. 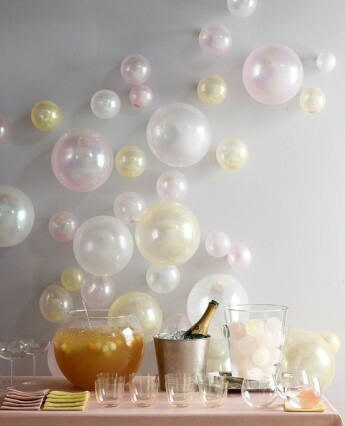 For a special touch, add in a 'signature' cocktail that compliments the theme of your party; I have found that these creative concoctions always delight the party-goers and make for a fun & carefree afternoon. We did 'Turbulence Tamer' white sangria cocktails for my son's 2nd Airplane-themed birthday party...a big hit with the parents who spent the afternoon chasing rowdy toddlers around. And now that you have a gorgeous beverage dispenser or two, you might as well get your $20 worth!! And there you have it! 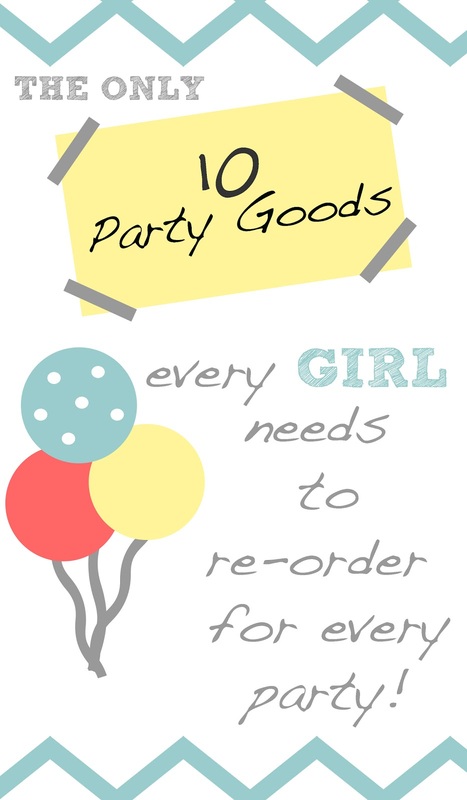 Two days of 'TOP TEN' to get you completely prepared for any party or event your are putting together! I hope this helps eliminate some stress and gets you excited for all of the upcoming fun to be had. I can't wait to see what you come up with...happy planning everyone!